Experience the Milky Way at the Tongariro, shooting stars streaming in the clarity that only the pre-dawn can achieve, come and see the sunrise at Red Crater and enjoy breakfast alfresco. Sunrise tours route taken often varies between the standard route to the standard route in reverse, and sometimes a route that takes us back to the start. The route picked is dependent on weather conditions, time of year and your needs and ability. The sunrise route is the same route as the daytime tour but with one obvious exception ... NO CROWDS! Guide/s, transport between the Adrift Tongariro base and the activity, breakfast (vegetarian available on request at time of booking), $40 of clothing and footwear hire (boots $20, clothing $10 per item). Return: These vary in accordance with the changing sunrise times but vary between 9.30am-11.00am. Water (1-1.5 litres), Personal medications (e.g. Asthma Inhaler, blister protection etc. ), sunscreen, sunglasses, backpack per person, hiking boots, thermal longs and/or walking trousers & over-trousers, 3 warm top layers (wool, merino, thermals, fleece, soft shell etc. are good layers), Waterproof raincoat, Warm hat and gloves. Adrift Tongariro has available for hire personal equipment footwear and clothing to supplement that which you don’t have and need including boots, socks, thermal longs, fleece longs, waterproof pants, thermal tops, fleece tops, waterproof tops, warm gloves, warm hats, sun hats, sunglasses, backpacks, walking poles, sleeping bags and liners. 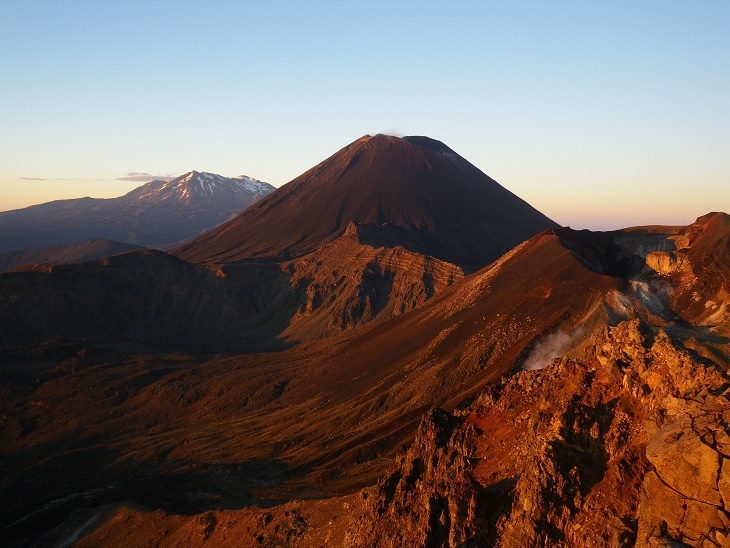 In the event that Adrift Tongariro consider the weather to be of such a nature to expose the group to undue risk then Adrift Tongariro will defer the tour to a day tour. PLEASE ALLOW FOR THIS IN YOUR ITINERARY. If a day tour does not proceed and an alternative tour is not viable then a full refund will be given. If Adrift Tongariro defer a sunrise tour to a day tour the difference in the cost of these two tours will be refunded. See Terms and Conditions.